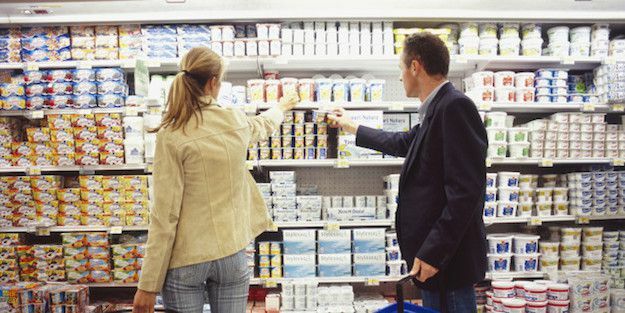 I’m sure you’ve caught a glimpse of probiotic yogurt while perusing the dairy aisle at your local grocery store. There’s no doubt that probiotic foods are increasingly popular right now due to their immense health benefits like better digestion, improved immunity, balanced bacteria levels, relief from digestive issues, weight loss, and so much more. In fact, we wrote an entire blog post all about probiotic foods. If you missed it, no worries, you can check it out right here! So, back to our grocery store flashback. It’s a little intimidating when you’re standing in front of the Great Wall of Yogurt, pretending like you’re actually about to make a decision, while people passive-aggressively play bumper car(t)s around you and the mini traffic jam you’ve now created. You’re mouthing apologetically as the mental anguish of picking out a dang yogurt is still a real issue. Along with the fact you didn’t bring enough clothes to be standing in the Artic Dairy Aisle for this long. You can only fake legitimate decision making for so long. At some point you have to retreat and try again another time when you’re better equipped with knowledge, jackets, and potentially some light snacks. If you’ve struggled with something along these lines, you’re not alone. I’ve spent my fair share of time staring blankly into the yogurt abyss. Or just impulsively grabbing whatever strikes my fancy at the time and then regretting my decision the second I belly up to the most awful tasting yogurt ever. Some yogurts just shouldn’t be available for human purchase and/or consumption, in my opinion. For the sake of everything that’s good and right, let’s finally figure out probiotic yogurt, what it is, and how to pick it out (in a reasonable amount of time). 1. 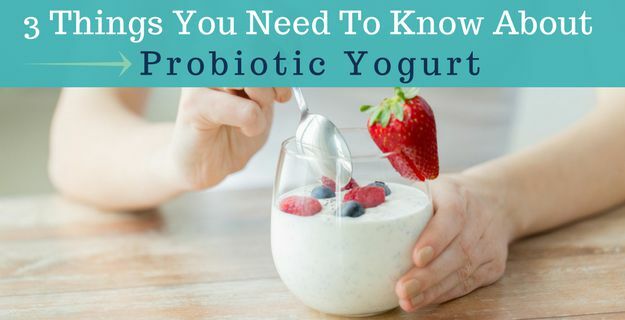 First Off, What Is Probiotic Yogurt? A great place to start in all this is determining what probiotics actually are. Probiotics are friendly, living microorganisms (bacteria) that produce health benefits to the host (you), such as improving digestive and immune function. We have myriads of bacteria roaming around in our body. Probiotics are the good kind of bacteria that helps protect us from the bad, pathogenic kind. Basically, probiotics = good. And we want plenty of them in our body. Well, there’s a number of different ways like eating probiotic-rich or fermented foods and taking a quality probiotic supplement. Also, by getting plenty of rest, regular physical activity, and eating a diverse range of whole, healthy foods, including prebiotic foods because prebiotics help feed probiotics. It’s important to avoid overusing antibiotics, smoking cigarettes, and constantly being under high stress levels. All of these harm the health of your gut bacteria. There’s a very delicate balance between good and bad bacteria, so we need to constantly be supplying our body with friendly bacteria. Probiotic yogurt contains these strains of living, beneficial bacteria. And yogurt happens to be one of the most notable in the category of probiotic-rich foods. So problem solved! We’ll just load up on yogurt and parfaits and our microbiome will be peachy-keen! Not all yogurt is “probiotic yogurt”. Yep, not all yogurt actually has living probiotics, even though they contain the bacteria in general. This is when our once happy-go-lucky yogurt shopping spree unexpectedly turns into milky-mayhem. But not to worry, we’ll have you on your merry way in just a few easy steps. Before we get into the steps, we need to go over one last thing about yogurt for the steps to make sense. 2. 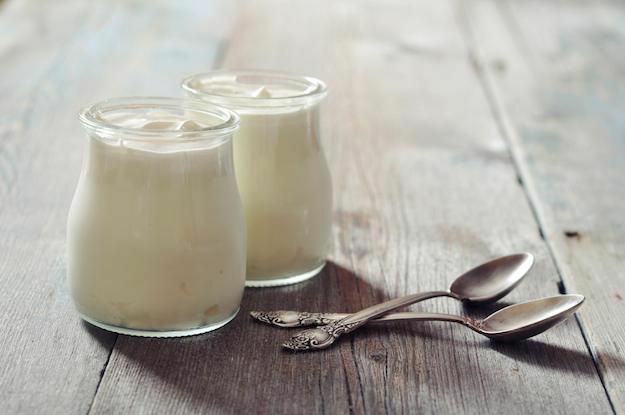 How Does Yogurt Contain Probiotics? During our probiotic yogurt journey, we’ve learned the probiotic portion, now it’s time for the yogurt side of things. You probably know the gist of how yogurt is made but it’s not really on your top list of priorities. You’re more concerned about flavor, fat, carb, or sugar content, and consistency when you’re shopping for a yogurt. Well, there’s quite a bit going on behind the scenes to get that particular yogurt in front of you. Yogurt is basically fermented milk. First, milk is heated, pasteurized, and homogenized. Next, the milk is allowed to cool. Once it’s cooled, it’s then introduced to bacteria starters or “probiotic cultures”, which include Lactobacillus bulgaricus and Streptococcus thermophiles. Sometimes additional bacteria, like strains from the Lactobacillus and Bifidobacterium species, are added for greater health benefits. If you’re familiar with probiotics then you may recognize these particular strains or species or notice them listed in your probiotic supplement. So the cultures are now combined with the treated milk and they’re incubated at specific temperatures to increase bacterial activity and promote fermentation. Fermentation occurs when the bacteria strains convert the lactose (the fancy word for milk sugar) into lactic acid. Lactic acid goes to work and acts on the milk protein. This intermingling of acid and protein thickens the milk and results in that traditional tangy, tart taste and familiar texture of yogurt. So now we have yogurt with healthy microbes (aka probiotics). Yay! But there’s one more step in this process that quickly takes you from friendly, living bacteria to none whatsoever. In the United States, some yogurts are heat-treated after the fermentation process. Unfortunately, heat doesn’t discriminate and it kills both the bad AND good bacteria. So there go all of our beneficial probiotics! Yogurt naturally contains good bacteria but they can easily be lost if they endure high temperatures. So how do we make sure our yogurt has living probiotics? 3. 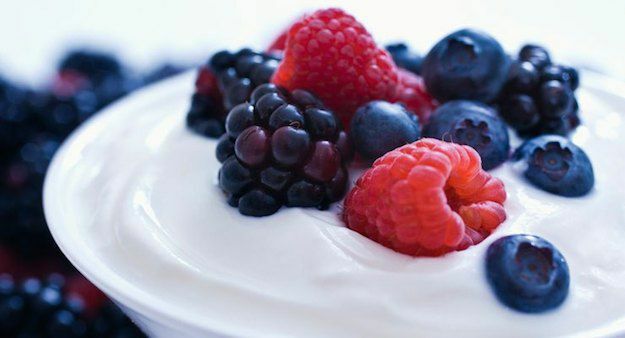 How To Choose The Right Probiotic Yogurt? This is all pretty confusing but there are a few easy steps to make sure you’re getting probiotic rich yogurt. The key to making the right yogurt choice is to be certain it has live and active cultures. Hmm, how are we supposed to know this? Well, the National Yogurt Association (NYA) has made this part super easy for us. The NYA has established probiotic standards for a yogurt to be considered healthy. A yogurt must have a minimum of 100 million cultures per gram at the time of manufacture. If a yogurt meets or exceeds these standards, then it can get a seal on the label. 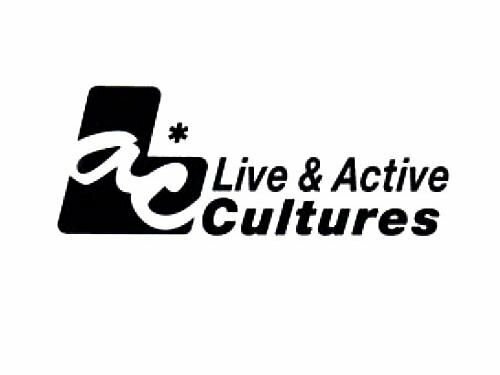 Look for the National Yogurt Association’s “Live and Active Cultures” (LAC) seal on the container. However, it’s voluntary for a company to get the LAC seal. So if you don’t see it on the container, then flip it over and look at the ingredient list. Look for the phrase “live and active cultures” to make sure you’re getting healthy bacteria. Companies will usually list probiotic strains and even the amounts that are in the yogurt. First, avoid lots of added sugar. Yogurt naturally has milk sugar called lactose. So there will be about 9 grams of sugar in a 6-ounce container of just plain yogurt. And there’s about 7 grams if you’re looking at regular Greek yogurt. So try to avoid anything with 20 grams or more of sugar. Also, check the ingredient label and make sure sugar isn’t the first or second ingredient (that means there’s a TON of it in there). Beware of super low sugar amounts because that means artificial sugars were used. Artificial sweeteners or sugars have their own list of potential negative side effects, one being belly upsets! Your best bet is to find a yogurt that’s naturally or only lightly sweetened. Second, avoid lengthy ingredient profiles. Your yogurt shouldn’t have a crazy long ingredient list. You want to keep it natural, which means as few added ingredients as possible. If it has paragraphs of ingredients or words you can’t pronounce, ditch it! Yogurt is an amazing food that touts great health benefits. But not all yogurts are created equal. Make sure to choose a “probiotic yogurt” or yogurt that contains live, healthy bacteria. Use these 2 simple steps and take the guesswork out of probiotic yogurt buying!